Editable royalty-free map of Sweden in vector-graphic online store. 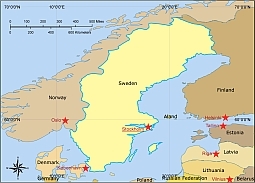 Televisions: 470 per 1,000 poepleLYING BETWEEN NORWAY and Finland, Sweden stretches from the Arctic north to the fertile south, where most of its small population lives. Sweden’s long industrial traditions and of the world’s most advanced manufacturing countries. Like its neighbors, Sweden is a prosperous place, where equal rights for all groups in society are taken very seriously.